Have you ever considered how a dive destination develops? Why does the boat dive where it does? Most well traveled divers probably never consider how difficult it can be to find a stellar new dive site, one that can make or break an itinerary. A few of the more knowledgeable group leaders, in Indonesia and the Bird’s Head Seascape, are always looking for new itineraries and ways to improve standard trip routes. We spend a lot of time diving new locations in the hope of finding a “keeper”. This doesn’t happen often! For every exploratory dive made, roughly 10% are even worth diving again. Finding a really good one…”priceless”! The increasingly popular itinerary that starts in Sorong (Raja Ampat) and ends, or round-trips, in Kaimana (Triton Bay) has always had one week spot, however. This journey involves a long, 210 mile, passage between the southern part of Raja (SE Misool) and Kaimana/Triton Bay. Divers, myself included, never want to spend time motoring when they could be diving, so a stop in the Pisang Islands and another near Mommon (halfway between Pisang and Triton) is usually the itinerary we choose. There is an outstanding site in Pisang (T-Bone Reef), plus a couple of others that are good, so this stopover is usually a hit for the long transit day. But until recently the Mommon stopover was, well…other than a visit to the picturesque waterfall…a diving bust! As more boats make this run, the Mommon stopover has become increasingly important, so group leaders like ourselves and Mike Veitch (Underwater Tribe), my wife calls us “destination developers”, spend time on every trip looking for new sites to share with our shipmates. In January I reported on a spectacular new site, Batu Cantik, we discovered just outside Mommon Bay. Shortly after our trip Mike Veitch visited the area. When I asked him how he liked Batu Cantik (Beautiful Rock), he said that he never had a chance to dive it because he had found a sea mount with a beautiful hard coral garden and MANTAS! Instead of trying Batu Cantik, he and his guests elected to spend their time on the seamount. Mike says the seamount is located due west of Mommon’s waterfall. (It is shown on most marine charts.) 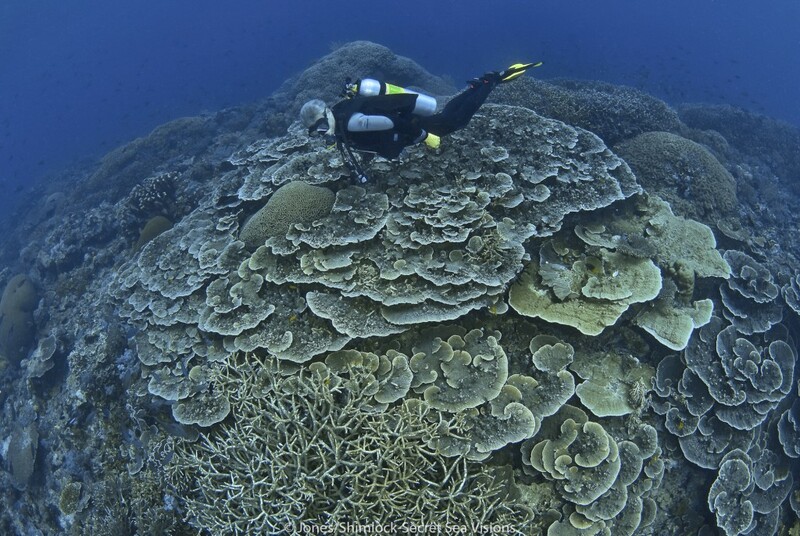 The site consists of a large seamount/dome of hard corals in excellent condition. But what really got his attention was the recurring encounters with mantas. The shallowest spot on the dome is 3 meters. NOTE: due to the variability of GPS units, especially in remote locations, the coordinates of this site might be slightly different than those given here. So now Mommon has plenty to offer the transiting diver. “Mike’s Mount“, as I choose to call it hoping Mike doesn’t mind, coupled with Batu Cantik will fill the day leaving most divers wanting more. We will be revisiting the area twice early next year, I’m looking forward checking out Mike Mount. I wonder if it will be so good that we choose to spend the day there? But I have a feeling that a quick dip on Batu Cantik’s soft-coral covered bommies might be included. Enjoy the diving and thanks Mike! Burt Jones and Maurine Shimlock are marine life photojournalists and “destination developers”. They have dived extensively in South Pacific but now specialize in Indonesia and the Bird’s Head. They are this website’s co-creators and administrators. To view more of their work visit their website, Secret Sea Visions.